Augmented reality (AR) technology integrates digital information with the physical environment, live and in real time. Through the addition of graphics, sounds, haptic feedback and/or smell to the natural world as it exists, AR is able to combine real life with a super-imposed image or animation using the camera on a mobile device or a special headgear. AR technology reached worldwide recognition after the launch of the popular mobile game Pokémon GO, one of the world’s leading gaming app titles; in 2017, spending on Pokémon GO accounted for 84 percent of the entire mobile AR consumer spending. AR technology is used across numerous industries such as: healthcare, public safety, gas and oil, tourism, marketing etc. Everyone from tourists to soldiers to someone looking for the closest subway stop is able to benefit from this ability to place computer-generated graphics in ones field of vision. In contrast to virtual reality (VR), which creates an artificial environment, AR simply makes use of the existing environment by overlaying new information on top of it. In AR, the information about the surrounding real world is made available to the user for information and/or interaction; for example in helmets for construction workers displaying information about the construction site. Worldwide shipment of smart glasses are forecast to reach 32.7 million units by 2022. The global augmented reality market is expected to grow significantly to about 198 billion U.S. dollars by 2025. 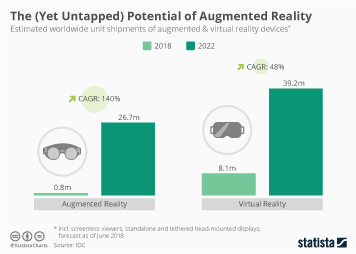 The AR and MR (mixed reality) hardware segment is forecasted to gradually outweigh the software segment, amounting to a market revenue of 12 billion U.S. dollars by 2021. In 2022, AR headsets shipment is projected to reach an estimated 26.7 million units — in comparison to 39.2 million VR headsets.